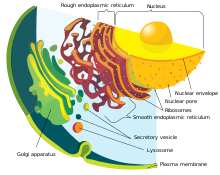 In mammals, the nuclear membrane can break down within minutes, following a set of steps during the early stages of mitosis. First, M-Cdk's phosphorylate nucleoporin polypeptides and they are selectively removed from the nuclear pore complexes. After that, the rest of the nuclear pore complexes break apart simultaneously. Biochemical evidence suggests that the nuclear pore complexes disassemble into stable pieces rather than disintegrating into small polypeptide fragments. M-Cdk's also phosphorylate elements of the nuclear lamina (the framework that supports the envelope) leading to the disassembly of the lamina and hence the envelope membranes into small vesicles.Electron and fluorescence microscopy has given strong evidence that the nuclear membrane is absorbed by the endoplasmic reticulum—nuclear proteins not normally found in the endoplasmic reticulum show up during mitosis.